Ned Air is a leading manufacturer of air treatment systems, heat recovery units, roof ventilators and exhaust fans. With our passion for technology we create a sustainable solution based on the latest air treatment technology. 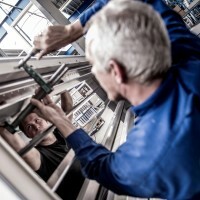 For us, your specific ventilation requirement is a challenge: we specialise in customised solutions. For more than 25 years our products have been successfully used in, among others, housing construction, non-residential construction, industry, the food and health sectors, the shipping and offshore industries, horticulture, defence and education. We contribute towards a healthy indoor environment for person, animal, plant and machine. As part of the German listed company Centrotec Sustainable AG we work with passion and drive towards a sustainable future. Centrotec is specialised in energy-efficient building technology and is market leader in the field of climate technology. Our expertise, client-oriented approach, transparency and entrepreneurship makes Ned Air your ideal partner in air treatment. Are you looking for the latest technology with low energy and maintenance costs? Our climate systems are energy-efficient, comply with the latest ErP standards and have a low total cost of ownership (TCO). Our compact air treatment units are fitted with double-walled panels free from thermal bridges, that are extremely strong and of the highest quality. The compact construction method can be attributed to our patented air separation module. This ensures optimum comfort, regulated by the most modern regulation technology. Ned Air’s products produce the desired climate in all kinds of indoor spaces, in an energy efficient manner. Yet still, our sense of environmental responsibility doesn’t end with the development of energy efficient products. We continually strive for higher and higher standards in the execution of our operational activities and processes. Click here to read more about our corporate social responsibility. Would you like to keep up to date with all the latest developments? Then register now for our newsletter! Ned Air makes the impossible possible. We develop energy-efficient air solutions for the indoor climate with innovative and sustainable technologies. In our organization, the customer is always central. You will experience this in the contact with all employees, both by telephone and on location. Your ventilation issue is a challenge for us. We will come with the best solution! At Ned Air, sustainable cooperation is the most important. You can count on good service. We make clear appointments. With a short delivery time. Ned Air is driven by passion for technology. Knowledge, expertise and experience have made Ned Air what it is today. If you are looking for quality, then choose Ned Air! Our climate systems comply with all applicable standards and requirements. Ned Air operates with various different export partners within Europe. Ned Air is a part of the German listed company Centrotec Sustainable AG. Centrotec has branches in 50 countries around the world. Centrotec is specialised in energy-efficient building technology and is market leader in the field of climate technology. The company develops innovative technologies and system solutions, and energy saving climate solutions for buildings.